Why hello there, I’m Darla. I may look sweet and innocent, but you’ll find out I am really a Little Rascal! 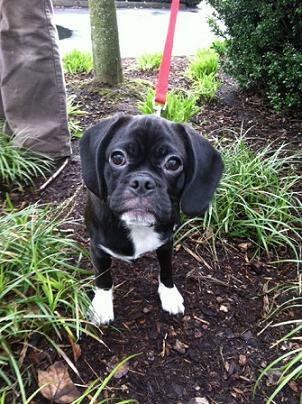 I am a 4 month old Puggle looking for a fun-loving house where I can cause all sorts of shananigans! Between racing around pulling all of my toys out of the toybox and teasing all the handsome boy dogs my days are full of excitement and adventure. I am one happy, happy, happy girl, that’s for sure! At the end of the day after I’m spent from all of the fun and games I am sure to be your perfect companion. Just fix me some warm milk and sing me a lullaby and I am your cuddle muffin! So what do you say, want to snuggle with a Puggle? I am fixed, vaccinated and microchipped. My adoption fee is $300. I am currently living in foster care so fill out an application at pixieproject.org and send it in so we can meet!